CHRISTMAS ORNAMENTS FROM BALI, WAYANG-KULIT STYLE: ALL ORNAMENTS ARE $6.95 PLUS 2.50 SHIPPING WITHIN USA. OCTOBER 2012 PLEASE CONTACT US VIA EMAIL AT PARADISEPRODUCTS1@YAHOO.COM OR CHRISTMASWAYANG@GMAIL.COM THANK YOU VERY MUCH. ALL ORNAMENTS ARE $6.95 PLUS 2.50 SHIPPING WITHIN USA. OCTOBER 2012 PLEASE CONTACT US VIA EMAIL AT PARADISEPRODUCTS1@YAHOO.COM OR CHRISTMASWAYANG@GMAIL.COM THANK YOU VERY MUCH. THESE FLAT, LIGHTWEIGHT, UNBREAKABLE HANGING ORNAMENTS CAN ALSO BE USED IN A VARIETY OF OTHER WAYS. THEY CAN VERY BEAUTIFULLY AND EASILY BE ADDED TO CHRISTMAS GIFT BASKETS OR HAMPERS. THEY ARE PERFECT TO USE AS PLACE-SETTING GIFTS AT A CHRISTMAS MEAL TABLE--SET ON A FOLDED LINEN NAPKIN OR PLACED IN A GLASS GOBLET TO ENCHANT YOUR DINNER GUESTS. IDEAL FOR CORPORATE CHRISTMAS FUNCTIONS. AS THEY ARE FLAT, THEY CAN EASILY BE MAILED VERY INEXPENSIVELY IN AN ENVELOPE TO FRIENDS, FAMILY, AND BUSINESS CONTACTS. THEY CAN BE PASTED ONTO THE FRONT OF A PLAIN PAPER CARD TO MAKE AN EXQUISITE, PERMANENT KEEPSAKE GIFT--MAIL THEM WITH JOY TO YOUR LOVED ONES. HOTELS CAN PRESENT THEM TO VIP GUESTS UPON CHECK-IN DURING CHRISTMAS WEEK--A PERFECT, EASILY TRANSPORTABLE, HOTEL-HOLIDAY KEEPSAKE. 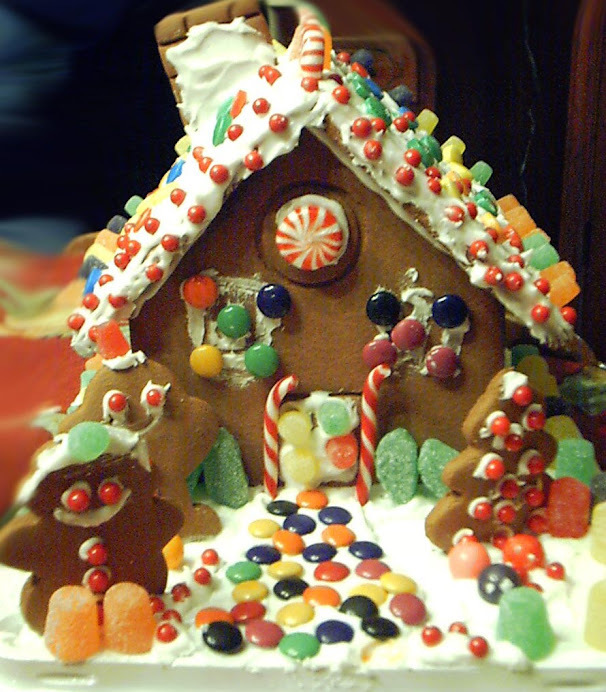 THE GINGERBREAD HOUSE IS ON ORDER AND AVAILABLE SOON FROM THE VILLAGE CRAFTSMAN. ONE OF THE MOST POPULAR FORMS OF NIGHT ENTERTAINMENT IN BALI AND JAVA IS THE WAYANG KULIT SHADOW PUPPET PLAY. LEATHER PUPPETS ARE DISPLAYED BEHIND A TRANSLUCENT SCREEN, ILLUMINATED BY AN OIL LAMP. THE PUPPET MASTER, OR DALANG, ACTS OUT WITH HIS PUPPETS THE ENORMOUSLY POPULAR STORIES OF THE ANCIENT HINDU EPICS, THE RAMAYANA AND THE MAHABHARATA. THERE ARE DOZENS OF CHARACTERS, AND ONLY A FEW CAN BE DISPLAYED AT ONCE. THE ONES NOT BEING USED ARE HELD ON EACH SIDE OF THE SCREEN BY THRUSTING THEIR SUPPORTING HANDLES INTO A LONG SECTION OF BANANA PSEUDOSTEM (FIBROUS TRUNK). 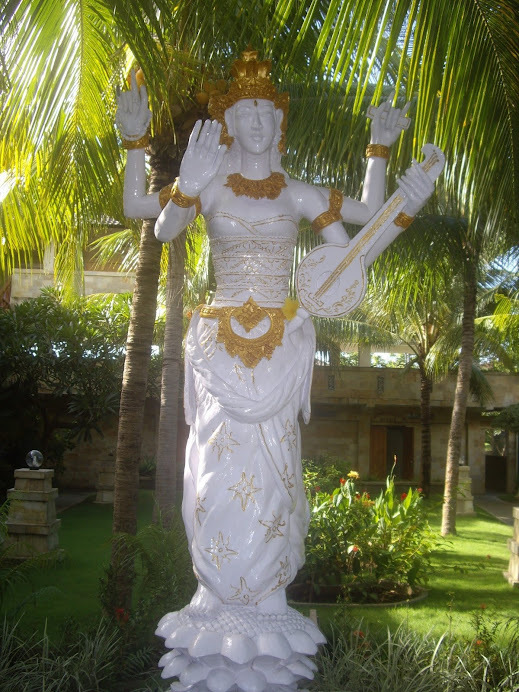 UNDER PRODUCTION IN BALI--NEW MODEL OF SARASWATI AS AN ANGEL. BEYOND THE SCREEN: WAYANG, THE TRADITIONAL SHADOW PUPPET THEATER, HAS BEEN INTEGRAL TO JAVANESE LIFE FOR AT LEAST A MILLENIUM. 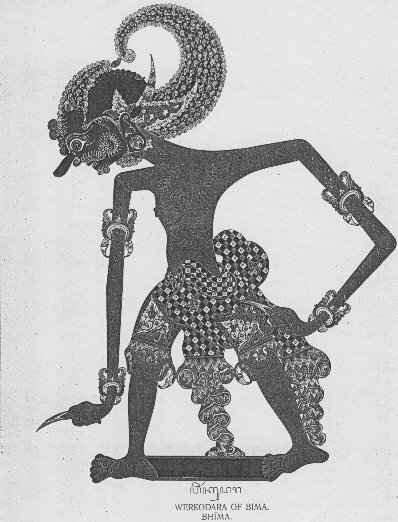 BASED LARGELY ON THE TALES OF THE HINDU EPIC, THE MAHABHARATA, THE WAYANG USES HIGH DRAMA, ACTION, SLAPSTICK COMEDY, AND SATIRE TO ENTERTAIN, INSTRUCT, AND EXAMINE BALINESE SOCIETY. IT HAS MANY FORMS INCLUDING FLAT LEATHER PUPPETS, WOODEN (WAYANG GOLEK) PUPPETS, OR EVEN HUMAN ACTORS IN FACE PAINT. THE INANIMATE WAYANG ARE MANIPULATED BY A DALANG (EXPERT PUPPETEER). SACRED WAYANG KULIT SHADOW PLAY PERFORMANCE AT A HOME COMPOUND IN SERIRIT, BALI. THE MAGICAL, ANCIENT DANCE OF THE SHADOW PUPPET FIGURES. THE BALINESE OFTEN HIRE A WAYANG KULIT SHADOW PUPPET PERFORMANCE TO ENTERTAIN GUESTS AT THE THREE-MONTH BABY CEREMONY--THIS IS THE FIRST TIME THAT A NEWBORN CHILD IN BALI IS ALLOWED TO PLACE ITS FEET ON THE GROUND. THE OCCASION WAS THE THREE-MONTH BABY CEREMONY FOR MISS ERA AND DEBE'S CHILD. HISTORICALLY, THE WAYANG KULIT SHADOW PUPPET PERFORMANCE CONSISTED OF SHADOWS CAST ON A COTTON SCREEN AND AN OIL LAMP. TODAY, THE SOURCE OF LIGHT USED IN WAYANG PERFORMANCE IN JAVA IS MOST OFTEN A HALOGEN ELECTRIC LIGHT. THE HANDWORK INVOLVED IN MAKING A WAYANG KULIT FIGURE THAT IS SUITABLE FOR A PERFORMANCE TAKES SEVERAL WEEKS, WITH THE ARTISTS WORKING TOGETHER IN GROUPS. THEY START FROM MASTER MODELS (TYPICALLY ON PAPER) WHICH ARE TRACED OUT ONTO KULIT (SKIN OR PARCHMENT), PROVIDING THE FIGURES WITH AN OUTLINE AND WITH INDICATIONS OF ANY HOLES THAT WILL NEED TO BE CUT (SUCH AS FOR THE MOUTH OR EYES). THE FIGURES ARE THEN SMOOTHED, USUALLY WITH A GLASS BOTTLE, AND PRIMED. THE STRUCTURE IS INSPECTED AND EVENTUALLY THE DETAILS ARE WORKED THROUGH. A FURTHER SMOOTHING FOLLOWS BEFORE INDIVIDUAL PAINTING, WHICH IS UNDERTAKEN BY YET ANOTHER CRAFTSMAN. FINALLY, THE MOVABLE PARTS (UPPER ARMS, LOWER ARMS WITH HANDS AND THE ASSOCIATED STICKS FOR MANIPULATION) MOUNTED ON THE BODY, WHICH HAS A CENTRAL STAFF BY WHICH IT IS HELD. A CREW MAKES UP TO TEN FIGURES AT A TIME, TYPICALLY COMPLETING THAT NUMBER OVER THE COURSE OF A WEEK. WAYANG IS AN INDONESIAN WORD FOR THEATER. BAYANG, THE JAVANESE WORD FOR SHADOW OR IMAGINATION, ALSO CONNOTES "SPIRIT." WHEN THE TERM IS USED TO REFER TO PUPPET THEATER, THE PUPPET ITSELF IS SOMETIMES REFERRED TO AS WAYANG. THERE ARE MANY FORMS OF WAYANG, INCLUDING DANCES PERFORMED WITH MASKS AND DRAMAS PERFORMED WITH WOODEN, JOINTED PUPPETS, BUT THE MOST FAMOUS IS WAYANG KULIT, "SHADOW PUPPET THEATER." ONLY THE SILHOUETTE SHADOWS OF THE PUPPETS ARE SEEN BY THE AUDIENCE, PROJECTED ONTO A COTTON SCREEN. PERFORMANCES OF SHADOW PUPPET THEATER ARE ACCOMPANIED BY A GAMELAN ORCHESTRA IN JAVA, AND BY "GENDER WAYANG" MUSIC IN BALI. ALTHOUGH WAYANG MAY HAVE EXISTED BEFORE THE ARRIVAL OF HINDUSIM IN INDONESIA, MANY OF THE STORIES IN WAYANG DRAMAS ARE TAKEN FROM THE MAHABHARATA OR THE RAMAYANA, AND PORTRAY THE ONGOING BATTLE BETWEEN GOOD AND EVIL. WAYANG PLAYS CAN LAST AS LONG AS EIGHT HOURS AND ARE FREQUENTLY PERFORMED DURING SACRED TEMPLE CEREMONIES, AT PRIVATE FUNCTIONS SUCH AS WEDDINGS AND THREE-MONTH BABY CEREMONIES, AND FOR THE PUBLIC IN THE VILLAGES. THE SKILLED CRAFTSMAN WHO HAND-MADE THE GORGEOUS DOUBLE BELLS AND SNOWFLAKE-STAR CHRISTMAS ORNAMENTS (MAN ON THE LEFT). TRADITIONAL BALINESE HOUSING COMPOUND HOME WORKSHOP. THE TRADITIONAL BALINESE WAYANG KULIT PUPPETS ARE MADE OF WOOD AND BUFFALO HIDE. UNLIKE THREE-DIMENSIONAL, BALINESE AND JAVANESE WAYANG GOLEK ROD PUPPETS, WAYANG KULIT PUPPETS ARE FLAT WITH MOVEABLE LEATHER ARMS, HOLES AND CUTS TO ALLOW PLAY IN THE OIL-LAMP-LIT SHADOWS, AND PENCIL LINES. THE MAGICAL ARTISTIC FLAIR OF RELIGIOUS BALI CREATES A CHRISTMAS ORNAMENT TO TREASURE FOREVER--THE CHILDREN'S VOICES SINGING TO HEAVEN. HAND-MADE AND HAND-APPLIED PAINT DONE IN CHEERFUL, LONG-LASTING CHRISTMAS COLORS. SILENT NIGHT, HOLY NIGHT. MADE WITH LOVE, GOD, AND SPIRITUALITY ON BALI. Each hanging, Christmas tree ornament is individually handmade in a home village workshop by a local craftsman from traditionally processed leather. The CHRISTMAS CAROL ORNAMENT for sale here is individually hand created, hand cut, hand painted, and hand-finished. Each detailed piece is double--sided, making it particularly beautiful, usable, and valuable: the design is very closely identical on both sides. The unique ornaments have been commissioned, designed to order, and adapted to Western Christmas themes, concepts, and motifs with stunning, art gallery-quality results. This thick, durable, square ornament depicts two angelic, blonde-haired children--a girl and a boy--singing Christmas carols with a decorated Christmas tree in the background and candles in the foreground. The scene appears in sweet, spiritual, religious RED, ORANGE, WHITE, AND BLUE HUES. This beautiful holy image measures 5 1/2 inches tall and 3 7/8 inches wide. This thick, durable, square ornament depicts two angelic, blonde-haired children--a girl and a boy--singing Christmas carols with a decorated Christmas tree in the background and candles in the foreground. The scene appears in sweet, spiritual, religious RED, ORANGE, WHITE, AND BLUE hues. This beautiful holy image measures 5 1/2 inches tall and 3 7/8 inches wide. THE CHRISTMAS CAROL SQUARE ALSO COMES IN BRIGHT, CHEERFUL, HOLIDAY GREEN-YELLOW-GOLD COLORS. BEAUTIFUL, DELICATE, TEDDY SANTA BEAR REPRESENTS THE FINEST HANDCRAFTED ARTISANRY FROM THE LEGENDARY, TROPICAL ISLAND OF BALI. BALI IS FAMOUS FOR BREATH-TAKING LANDSCAPES, VOLCANOES, EMERALD RICE TERRACES, COLORFUL FLOWERS, AND WORLD-RENOWNED WHITE SAND BEACHES. BALI IS ALSO ADMIRED FOR ITS ART: THE BALINESE ARE GIFTED IN PAINTING, STONE-CARVING, WOOD CARVING AND SCULPTURE, GAMELAN MUSIC, AND DANCE: THREE MILLION PRODUCTIVE PEASANTS BY DAY, BRILLIANT ARTISTS BY NIGHT. THE LUSH ISLAND OF BALI IS A GREAT VERDANT STAGE FOR CONTINUOUS RELIGIOUS CEREMONIES AND SACRED PUPPET THEATRE PERFORMANCES. THESE RARE, BRAND NEW CHRISTMAS ORNAMENTS REFLECT BALI'S FAMOUS, ANCIENT SHADOW PUPPET PLAY THEATRE (WAYANG, MEANING PUPPET, KULIT MEANING SKIN) . THE WAYANG KULIT IS ONE OF THE GREAT, ANCIENT, STORY-TELLING TRADITIONS OF THE BALINESE AND JAVANESE: PERFORMANCES USE OVER SIXTY DIFFERENT PUPPET CHARACTERS CARVED OUT OF FLAT PIECES OF BUFFALO HIDE MANIPULATED BEHIND A SCREEN BY AN EXPERIENCED DALANG (PUPPET MASTER). EACH HANGING, TEDDY BEAR SANTA ORNAMENT IS INDIVIDUALLY HANDMADE IN A HOME VILLAGE WORKSHOP BY A LOCAL CRAFTSMAN FROM TRADITIONALLY PROCESSED LEATHER. THE LAVISHLY DECORATED AND HAND-PAINTED TEDDY SANTA BEAR FOR SALE HERE IS INDIVIDUALLY HAND CREATED, HAND-CUT, HAND-PAINTED, AND HAND-FINISHED. EACH DETAILED PIECE IS DOUBLE--SIDED, MAKING IT PARTICULARLY BEAUTIFUL, USABLE, AND VALUABLE: THE DESIGN IS VERY CLOSELY IDENTICAL ON BOTH SIDES. SURE TO BE A CHERISHED FAMILY HEIRLOOM, THE UNIQUE ORNAMENTS HAVE BEEN COMMISSIONED, DESIGNED TO ORDER, AND ADAPTED TO WESTERN CHRISTMAS THEMES, CONCEPTS, AND MOTIFS WITH STUNNING, ART GALLERY-QUALITY RESULTS. THIS MAGICAL TEDDY BEAR SANTA APPEARS IN BRIGHT, STRIKING HOLIDAY MAUVE-RED, BLUE, GREEN, AND YELLOW WITH SCALLOPED BORDER EDGES, TRADITIONAL CUTWORK, AND WHITE ORNAMENTAL ACCENTS. THE TEDDY SANTA BEAR IS AVAILABLE IN A CHOICE OF TWO COLORS: BRILLIANT MAUVE-RED, BLUE, GREEN, AND YELLOW AS PICTURED OR IN TRADITIONAL BRIGHT CHRISTMAS RED AND WHITE (WITH BLUE) SANTA CLAUS COLORS. AN ENTIRE CHRISTMAS TREE CAN BE DECORATED IN A WAYANG-KUILT-STYLE THEME WITH COLOR-COORDINATED SNOWFLAKE-STARS, DOUBLE-BELLS, CHRISTMAS CAROLLERS, ANGELS, NATIVITY SCENES, SANTAS WITH REINDEERS, SANTAS WITH SACKS OF PRESENTS, AND DECORATED ORNAMENTED TREES USING A VARIETY OF COLORS TO PROVIDE LIGHT AND LOVE ON CHRISTMAS DAY. THIS BEAUTIFUL, UNIQUE TEDDY BEAR SANTA MEASURES A PEFECT 5 3/4 INCHES TALL AND 2 3/8 INCHES WIDE. THIS STYLE OF CHRISTMAS ORNAMENT IS A BRAND NEW PRODUCT IN AMERICA AND IS ONLY AVAILABLE EXCLUSIVELY FROM PARADISE PRODUCTS INTERNATIONAL, LLC. Each DETAILED INDIVIDUAL TEDDY is double--sided, making it particularly beautiful, usable, and valuable: the design is very closely identical on both sides. The unique ornaments have been commissioned, designed to order, and adapted to Western Christmas themes, concepts, and motifs with stunning, art gallery-quality results. Each detailed TEDDY SANTA BEAR piece is double--sided, making it particularly beautiful, usable, and valuable: the design is very closely identical on both sides. Sure to be a cherished family heirloom, the unique ornaments have been commissioned, designed to order, and adapted to Western Christmas themes, concepts, and motifs with stunning, art gallery-quality results. AN INSTANT CONVERSATION PIECE AND A FUTURE FAMILY HEIRLOOM--TEDDY SANTA BEAR WILL HAPPILY LIGHT UP YOUR CHRISTMAS PINE TREE YEAR AFTER YEAR. HE WILL BRING YOU LOVVE AND LIGHT AND DEVOTION FROM BALI, THE LEGENDARY ISLAND OF THE GODS. This magical, deleicate-but-durable, ornate, Wayang-kulit style TEDDY BEAR SANTA represents the finest handcrafted artisanry from the legendary, tropical island of Bali. This hanging, Christmas tree ornament is individually handmade in a home village workshop by a local craftsman from traditionally processed leather. The TEDDY BEAR SANTA CLAUS for sale here is individually hand created, hand cut, hand painted, and hand-finished. THIS CONTEMPORARY, URBAN SANTA TEDDY BEAR WILL LIGHT UP YOUR TREE WITH SASS, ATTITUDE, AND CHRISTMAS FUN! SANTA TEDDY BEAR IS SWIFT OF FOOT AS HE ROLLERBLADES DOWN THE CHIMNEY ON CHRISTMAS EVE. SANTA CLAUS TEDDY COMES FROM THE ISLAND OF BALI--HANDCRAFTED BY VILLAGE ARTISTS WITH LOVE AND REVERENCE. BEAUTIFUL TEDDY SANTA BEAR--BEAUTIFUL CHRISTMAS FACE FRAMED IN MAUVE-REDS, GREEN, YELLOW, AND WHITE. FACE CLOSEUP. THIS BEAUTIFUL, UNIQUE TEDDY BEAR SANTA MEASURES A PEFECT 5 3/4 INCHES TALL AND 2 3/8 INCHES WIDE. OTHER TEDDY SANTA CLAUS BEARS WILL SOON BE AVAILABLE IN DIFFERENT MOTIFS FROM PARADISE PRODUCTS, INTERNATIONAL, LLC. BEAUTIFUL WAYANG-KULIT-STYLE LEATHER CUTWORK. SHADED MISTLETOE , EMERALD, AND LIME GREEN BASE BENEATH THE FEET. TEDDY BEAR SANTA LOOKS LIKE A TOUGH GUY, BUT HE IS ALL SWEET CHRISTMAS STYLE AND HOLIDAY CHEE WITH RED EYES, NOSE, AND MOUTH. THIS BEAUTIFUL, UNIQUE TEDDY BEAR SANTA MEASURES A PEFECT 5 3/4 INCHES TALL AND 2 3/8 INCHES WIDE. GIVE YOUR TREE AN ADORABLE PRESENT OF ITS OWN THIS YEAR.--A MYSTICAL, MIX AND MATCH MELANGE OF WAYANG CHRISTMAS ORNAMENTS. AN ENTIRE CHRISTMAS TREE CAN BE DECORATED IN A WAYANG-KUILT-STYLE THEME WITH COLOR-COORDINATED SNOWFLAKE-STARS, DOUBLE-BELLS, CHRISTMAS CAROLLERS, ANGELS, NATIVITY SCENES, SANTAS WITH REINDEERS, SANTAS WITH SACKS OF PRESENTS, AND DECORATED ORNAMENTED TREES USING A VARIETY OF COLORS TO PROVIDE LIGHT AND LOVE ON CHRISTMAS DAY. THIS BEAUTIFUL, UNIQUE TEDDY BEAR SANTA MEASURES A PEFECT 5 3/4 INCHES TALL AND 2 3/8 INCHES WIDE. THIS STYLE OF CHRISTMAS ORNAMENT IS A BRAND NEW PRODUCT IN AMERICA AND IS ONLY AVAILABLE EXCLUSIVELY FROM PARADISE PRODUCTS INTERNATIONAL, LLC. SANTA CLAUS IS COMING TO TOWN! This magical, Wayang-kulit style SANTA CLAUS ornament represents the finest handcrafted artisanry from the legendary, tropical island of Bali. Bali is famous for breath-taking landscapes, volcanoes, emerald rice terraces, colorful flowers, and world-renowned white sand beaches. Bali is also admired for its art: the Balinese are gifted in painting, stone-carving, wood carving and sculpture, gamelan music, and dance: three million productive peasants by day, brilliant artists by night. The lush island of Bali is a great verdant stage for continuous religious ceremonies and sacred puppet theatre performances. These rare, brand new Christmas ornaments reflect Bali's famous, ancient shadow puppet play theatre (wayang, meaning puppet, kulit meaning skin) . The wayang kulit is one of the great, ancient, story-telling traditions of the Balinese and Javanese: performances use over sixty different puppet characters carved out of flat pieces of buffalo hide manipulated behind a screen by an experienced dalang (puppet master). Each hanging, Christmas tree ornament is individually handmade in a home village workshop by a local craftsman from traditionally processed leather. The SANTA CLAUS WITH A SACK OF PRESENTS for sale here is individually hand created, hand cut, hand painted, and hand-finished. Each detailed piece is double--sided, making it particularly beautiful, usable, and valuable: the design is very closely identical on both sides. Sure to be a cherished family heirloom, the unique ornaments have been commissioned, designed to order, and adapted to Western Christmas themes, concepts, and motifs with stunning, art gallery-quality results. The TRADITIONAL STANDING SANTA CLAUS IN RED OUTFIT WITH WHITE BEARD AND SACK FULL OF PRESENTS appears in HOLIDAY RED, WHITE, BROWN, GREEN, AND BLUE hues. This beautiful UNIQUE SANTA measures a generous 6 1/4 inches tall and 3 5/8 inches wide. This style of Christmas ornament is a brand new product in America and is only available exclusively from Paradise Products International, LLC. SANTA CLAUS CARRYING SACK OF PRESENTS. UPPER -SECTION AND SACK OF PRESENTS CLOSEUP. The TRADITIONAL STANDING SANTA CLAUS IN RED OUTFIT WITH WHITE BEARD AND SACK FULL OF PRESENTS appears in HOLIDAY RED, WHITE, BROWN, GREEN, AND BLUE hues. This beautiful UNIQUE SANTA measures a generous 6 1/4 inches tall and 3 5/8 inches wide. This style of Christmas ornament is a brand new product in America and is only available exclusively from Paradise Products International, LLC. CLOSEUP OF SANTA'S FEET. Each hanging, Christmas tree ornament is individually handmade in a home village workshop by a local craftsman from traditionally processed leather. The SANTA CLAUS WITH A SACK OF PRESENTS for sale here is individually hand created, hand cut, hand painted, and hand-finished. The TRADITIONAL STANDING SANTA CLAUS IN RED OUTFIT WITH WHITE BEARD AND SACK FULL OF PRESENTS appears in HOLIDAY RED, WHITE, BROWN, GREEN, AND BLUE hues. This beautiful UNIQUE SANTA measures a generous 6 1/4 inches tall and 3 5/8 inches wide. SANTA CALAUS CARRYING SACK OF PRESENTS. CHEST-SECTION CLOSEUP. HEADING DOWN THE CHIMNEY! The TRADITIONAL STANDING SANTA CLAUS IN RED OUTFIT WITH WHITE BEARD AND SACK FULL OF PRESENTS appears in HOLIDAY RED, WHITE, BROWN, GREEN, AND BLUE hues. This beautiful UNIQUE SANTA measures a generous 6 1/4 inches tall and 3 5/8 inches wide. SANTA CLAUS CARRYING SACK OF PRESENTS. FACE CLOSEUP.. JINGLE BELLS, JINGLE BELLS! SANTA CLAUS CARRYING SACK OF PRESENTS. FACE, PRESENTS, AND DETAILED SACK CLOSEUP. REVERSE SIDE. SANTA CLAUS CARRYING SACK OF CHRISTMAS ORNAMENTS. SANTA STOMACH CLOSEUP. Each hanging, Christmas tree ornament is individually handmade in a home village workshop by a local craftsman from traditionally processed leather. The SANTA CLAUS WITH A SACK OF PRESENTS for sale here is individually hand created, hand cut, hand painted, and hand-finished. Each detailed piece is double--sided, making it particularly beautiful, usable, and valuable: the design is very closely identical on both sides. Sure to be a cherished family heirloom, the unique ornaments have been commissioned, designed to order, and adapted to Western Christmas themes, concepts, and motifs with stunning, art gallery-quality results. SANTA CLAUS IS COMING TO TOWN! He knows if you've been good or bad, so you better be good for goodness sake! This magical, Wayang-kulit style SANTA CLAUS ornament represents the finest handcrafted artisanry from the legendary, tropical island of Bali. Each hanging, Christmas tree ornament is individually handmade in a home village workshop by a local craftsman from traditionally processed leather. The SANTA CLAUS WITH A SACK OF PRESENTS for sale here is individually hand created, hand cut, hand painted, and hand-finished. Each detailed piece is double--sided, making it particularly beautiful, usable, and valuable: the design is very closely identical on both sides. Sure to be a cherished family heirloom, the unique ornaments have been commissioned, designed to order, and adapted to Western Christmas themes, concepts, and motifs with stunning, art gallery-quality results. The TRADITIONAL STANDING SANTA CLAUS IN RED OUTFIT WITH WHITE BEARD AND SACK FULL OF PRESENTS appears in HOLIDAY RED, WHITE, BROWN, GREEN, AND BLUE hues. This beautiful UNIQUE SANTA measures a generous 6 1/4 inches tall and 3 5/8 inches wide. NATIVITY SCENE. THE BIRTH OF JESUS. JOSEPH THE CARPENTER (MARY'S HUSBAND), MARY, THE BABY JESUS. THIS IS A UNIQUE, BEAUTIFUL MOTIF OF THE NATIVITY SCENE, TRADITIONALLY PORTRAYED AS THE MANGER IN THE BARN. DIMENSONS: 4 5/8 INCHES TALL, 3 3/8 INCHES WIDE. COLORFULLY DESIGNED AND BRILLIANTLY HAND PAINTED NATIVITY SCENE--THE BIRTH OF JESUS! This magical, ornate, Wayang-kulit style NATIVITY SCENE--THE BIRTH OF JESUS represents the finest handcrafted artisanry from the legendary, tropical island of Bali. Bali is famous for breath-taking landscapes, volcanoes, emerald rice terraces, colorful flowers, and world-renowned white sand beaches. Bali is also admired for its art: the Balinese are gifted in painting, stone-carving, wood carving and sculpture, gamelan music, and dance: three million productive peasants by day, brilliant artists by night. The lush island of Bali is a great verdant stage for continuous religious ceremonies and sacred puppet theatre performances. These rare, brand new Christmas ornaments reflect Bali's famous, ancient shadow puppet play theatre (wayang, meaning puppet, kulit meaning skin) . The wayang kulit is one of the great, ancient, story-telling traditions of the Balinese and Javanese: performances use over sixty different puppet characters carved out of flat pieces of buffalo hide manIpulated behind a screen by an experienced dalang (puppet master). DETAIL CLOSEUP. JOSEPH. Each hanging, NATIVITY SCENE ornament is individually handmade in a home village workshop by a local craftsman from traditionally processed leather. The LAVISHLY DECORATED, DETAILED, AND HAND-PAINTED NATIVITY SCENE for sale here is individually hand created, hand cut, hand painted, and hand-finished. Each piece is double--sided, making it particularly beautiful, usable, and valuable: the design is closely identical on both sides. Sure to be a cherished family heirloom, these unique ornaments have been commissioned, designed to order, and adapted to Western Christmas themes, concepts, and motifs with stunning, art gallery-quality results. This MAGICAL NATIVITY SCENE appears in BRIGHT, STRIKING CHRISTMAS BLUE, GREEN, RED, AND GOLD. NATIVITY SCENE. THE BIRTH OF JESUS. JOSEPH THE CARPENTER (MARY'S HUSBAND), MARY, THE BABY JESUS. THIS IS A UNIQUE, BEAUTIFUL MOTIF OF THE NATIVITY SCENE, TRADITIONALLY PORTRAYED AS THE MANGER IN THE BARN. DIMENSONS: 4 5/8 INCHES TALL, 3 3/8 INCHES WIDE. Sure to be a cherished family heirloom, these unique ornaments have been commissioned, designed to order, and adapted to Western Christmas themes, concepts, and motifs with stunning, art gallery-quality results. This MAGICAL NATIVITY SCENE appears in BRIGHT, STRIKING CHRISTMAS BLUE, GREEN, RED, AND GOLD. THIS SWEET NATIVITY SCENE IS COMPOSED OF JOSEPH THE CARPENTER (MARY'S HUSBAND), MARY, AND THE BABY JESUS ON HER LAP. THIS IS THE TRADITIONAL, ORIGINAL MOTIF FOR THIS HOLY EVENT: THE BABY JESUS IS BORN. THIS SACRED ORNAMENT WILL PROVIDE YEARS OF LIGHT AND LOVE AND DEVOTION ON CHRISTMAS DAY. This beautiful, unique NATIVITY SCENE--THE BIRTH OF JESUS measures a generous 4 5/8 inches tall and 3 3/8 inches wide. NATIVITY SCENE. DIMENSIONS: 4 5/8 INCHES TALL, 3 3/8 INCHES WIDE. Sure to be a cherished family heirloom, these unique ornaments have been commissioned, designed to order, and adapted to Western Christmas themes, concepts, and motifs with stunning, art gallery-quality results. This MAGICAL NATIVITY SCENE appears in BRIGHT, STRIKING CHRISTMAS BLUE, GREEN, RED, AND GOLD. THIS SWEET NATIVITY SCENE IS COMPOSED OF JOSEPH THE CARPENTER (MARY'S HUSBAND), MARY, AND THE BABY JESUS ON HER LAP. THIS IS THE TRADITIONAL, ORIGINAL MOTIF FOR THIS HOLY EVENT: THE BABY JESUS IS BORN. THIS SACRED ORNAMENT WILL PROVIDE YEARS OF LIGHT AND LOVE AND DEVOTION ON CHRISTMAS DAY. This beautiful, unique NATIVITY SCENE--THE BIRTH OF JESUS measures a generous 4 5/8 inches tall and 3 3/8 inches wide. MOTHER AND CHILD CLOSEUP DETAIL. BRILLIANTLY RENDERED AND HAND-PAINTED BY BALINESE ARTIST-CRAFTSMEN IN SMALL VILLAGE WORKSHOPS. NATIVITY SCENE. DIMENSIONS: 4 5/8 INCHES TALL, 3 3/8 INCHES WIDE. BRILLIANTLY RENDERED AND HAND-PAINTED BY BALINESE ARTIST-CRAFTSMEN IN SMALL VILLAGE WORKSHOPS. DETAIL CLOSEUP OF BABY JESUS. This MAGICAL NATIVITY SCENE appears in BRIGHT, STRIKING CHRISTMAS BLUE, GREEN, RED, AND GOLD. THIS SWEET NATIVITY SCENE IS COMPOSED OF JOSEPH THE CARPENTER (MARY'S HUSBAND), MARY, AND THE BABY JESUS ON HER LAP. THIS IS THE TRADITIONAL, ORIGINAL MOTIF FOR THIS HOLY EVENT: THE BABY JESUS IS BORN. THIS SACRED ORNAMENT WILL PROVIDE YEARS OF LIGHT AND LOVE AND DEVOTION ON CHRISTMAS DAY. NATIVITY SCENE--ORNAMENT HANGING AGAINST FOLIAGE. Each hanging, NATIVITY SCENE ornament is individually handmade in a home village workshop by a local craftsman from traditionally processed leather. The LAVISHLY DECORATED, DETAILED, AND HAND-PAINTED NATIVITY SCENE for sale here is individually hand created, hand cut, hand painted, and hand-finished. Each piece is double--sided, making it particularly beautiful, usable, and valuable: the design is closely identical on both sides. NATIVITY SCENE--ORNAMENT HANGING AGAINST FOLIAGE. JOSEPH, MARY, AND CHILD. COLORFULLY DESIGNED AND BRILLIANTLY HAND PAINTED NATIVITY SCENE--THE BIRTH OF JESUS! This magical, ornate, Wayang-kulit style NATIVITY SCENE--THE BIRTH OF JESUS represents the finest handcrafted artisanry from the legendary, tropical island of Bali. NATIVITY SCENE. THE BIRTH OF JESUS. JOSEPH THE CARPENTER (MARY'S HUSBAND), MARY, THE BABY JESUS. THIS IS A UNIQUE, BEAUTIFUL MOTIF OF THE NATIVITY SCENE, TRADITIONALLY PORTRAYED AS THE MANGER IN THE BARN. DIMENSONS: 4 5/8 INCHES TALL, 3 3/8 INCHES WIDE. This MAGICAL NATIVITY SCENE appears in BRIGHT, STRIKING CHRISTMAS BLUE, GREEN, RED, AND GOLD. THIS SWEET NATIVITY SCENE IS COMPOSED OF JOSEPH THE CARPENTER (MARY'S HUSBAND), MARY, AND THE BABY JESUS ON HER LAP. THIS IS THE TRADITIONAL, ORIGINAL MOTIF FOR THIS HOLY EVENT: THE BABY JESUS IS BORN. THIS SACRED ORNAMENT WILL PROVIDE YEARS OF LIGHT AND LOVE AND DEVOTION ON CHRISTMAS DAY. This beautiful, unique NATIVITY SCENE--THE BIRTH OF JESUS measures a generous 4 5/8 inches tall and 3 3/8 inches wide. REINDEERS TIGHT CLOSEUP. SANTA CLAUS IS COMING TO TOWN--RIDE STRAIGHT TO THE NORTH POLE ON THIS SLEIGH WITH REINDEERS! This magical, ornate, Wayang-kulit style SANTA CLAUS ON A SLEIGH WITH REINDEERS ornament represents the finest handcrafted artisanry from the legendary, tropical island of Bali. Bali is famous for breath-taking landscapes, volcanoes, emerald rice terraces, colorful flowers, and world-renowned white sand beaches. Bali is also admired for its art: the Balinese are gifted in painting, stone-carving, wood carving and sculpture, gamelan music, and dance: three million productive peasants by day, brilliant artists by night. REINDEER FIGURES CLOSEUP. Each detailed piece is double--sided, making it particularly beautiful, usable, and valuable: the design is very closely identical on both sides. Sure to be a cherished family heirloom, the unique ornaments have been commissioned, designed to order, and adapted to Western Christmas themes, concepts, and motifs with stunning, art gallery-quality results. The TRADITIONAL SANTA CLAUS IN RED OUTFIT SITTING IN A BLUE AND GOLD SLEIGH WITH BROWN REINDEERS appears in HOLIDAY RED, BLUE, BROWN, AND GOLD hues. This beautiful UNIQUE SANTA measures a generous 5 3/4 inches wide horizontally and 2 7/8 inches tall. ON DONNER, ON BLITZEN, ON DASHER, ON VIXEN, ON CUPID, ON COMET, ON PRANCER, ON DANCER!!!!!!! CLOSEUP OF THE REINDEER HERD IN GOLD HARNESSES. SANTA CLAUS, REINDEERS, SLEIGH TREE ORNAMENT. REVERSE SIDE. DIMENSIONS: 5 3/4 INCHES WIDE, 2 7/8 INCHES TALL. A WHOLESALE OR RETAIL QUANTITY OF 100 PIECES IS AVAILABLE RIGHT NOW. As each item is individually hand-produced, orders for the Christmas season should be placed as soon as possible. SANTA CLOSEUP DETAILS--REVERSE SIDE. Each hanging, Christmas tree ornament is individually handmade in a home village workshop by a local craftsman from traditionally processed leather. The SANTA CLAUS ON A SLEIGH WITH REINDEERS for sale here is individually hand created, hand cut, hand painted, and hand-finished. Each detailed piece is double--sided, making it particularly beautiful, usable, and valuable: the design is very closely identical on both sides. Sure to be a cherished family heirloom, the unique ornaments have been commissioned, designed to order, and adapted to Western Christmas themes, concepts, and motifs with stunning, art gallery-quality results. CLOSE UP OF SANTA ON THE SLEIGH. The TRADITIONAL SANTA CLAUS IN RED OUTFIT SITTING IN A BLUE AND GOLD SLEIGH WITH BROWN REINDEERS appears in HOLIDAY RED, BLUE, BROWN, AND GOLD hues. This beautiful UNIQUE SANTA measures a generous 5 3/4 inches wide horizontally and 2 7/8 inches tall. This style of Christmas ornament is a brand new product in America and is only available exclusively from Paradise Products International, LLC. SANTA CLAUS IS COMING TO TOWN--RIDE STRAIGHT TO THE NORTH POLE ON THIS SLEIGH WITH REINDEERS! This magical, ornate, Wayang-kulit style SANTA CLAUS ON A SLEIGH WITH REINDEERS ornament represents the finest handcrafted artisanry from the legendary, tropical island of Bali. Each detailed piece is double--sided, making it particularly beautiful, usable, and valuable: the design is very closely identical on both sides. Sure to be a cherished family heirloom, the unique ornaments have been commissioned, designed to order, and adapted to Western Christmas themes, concepts, and motifs with stunning, art gallery-quality results. Each hanging, Christmas tree ornament is individually handmade in a home village workshop by a local craftsman from traditionally processed leather. The SANTA CLAUS ON A SLEIGH WITH REINDEERS for sale here is individually hand created, hand cut, hand painted, and hand-finished. The TRADITIONAL SANTA CLAUS IN RED OUTFIT SITTING IN A BLUE AND GOLD SLEIGH WITH BROWN REINDEERS appears in HOLIDAY RED, BLUE, BROWN, AND GOLD hues. This beautiful UNIQUE SANTA measures a generous 5 3/4 inches wide horizontally and 2 7/8 inches tall. This magical, Wayang-kulit style CHRISTMAS CAROL ornament represents the finest handcrafted artisanry from the legendary, tropical island of Bali. Bali is famous for breath-taking landscapes, volcanoes, emerald rice terraces, colorful flowers, and world-renowned white sand beaches. Bali is also admired for its art: the Balinese are gifted in painting, stone-carving, wood carving and sculpture, gamelan music, and dance: three million productive peasants by day, brilliant artists by night. The lush island of Bali is a great verdant stage for continuous religious ceremonies and sacred puppet theatre performances. These rare, brand new Christmas ornaments reflect Bali's famous, ancient shadow puppet play theatre (wayang, meaning puppet, kulit meaning skin) . The wayang kulit is one of the great, ancient, story-telling traditions of the Balinese and Javanese: performances use over sixty different puppet characters carved out of flat pieces of buffalo hide manipulated behind a screen by an experienced dalang (puppet master). Each detailed piece is double--sided, making it particularly beautiful, usable, and valuable: the design is very closely identical on both sides. The unique ornaments have been commissioned, designed to order, and adapted to Western Christmas themes, concepts, and motifs with stunning, art gallery-quality results. This thick, durable, square ornament depicts two angelic, blonde-haired children--a girl and a boy--singing Christmas carols with a decorated Christmas tree in the background and candles in the foreground. The scene appears in sweet, spiritual, religious greens, gold, white, and blue hues. This beautiful holy image measures 5 1/2 inches tall and 3 7/8 inches wide. THE CHRISTMAS CAROL SQUARE ALSO COMES IN BRIGHT, CHEERFUL, HOLIDAY RED-ORANGE-GOLD COLORS. This thick, durable, square ornament depicts two angelic, blonde-haired children--a girl and a boy--singing Christmas carols with a decorated Christmas tree in the background and candles in the foreground. The scene appears in sweet, spiritual, religious greens, gold, white, and blue hues. This beautiful holy image measures 5 1/2 inches tall and 3 7/8 inches wide. Each hanging, Christmas tree ornament is individually handmade in a home village workshop by a local craftsman from traditionally processed leather. The CHRISTMAS CAROL ORNAMENT for sale here is individually hand created, hand cut, hand painted, and hand-finished. Each detailed piece is double--sided, making it particularly beautiful, usable, and valuable: the design is very closely identical on both sides. The unique ornaments have been commissioned, designed to order, and adapted to Western Christmas themes, concepts, and motifs with stunning, art gallery-quality results. This thick, durable, square ornament depicts two angelic, blonde-haired children--a girl and a boy--singing Christmas carols with a decorated Christmas tree in the background and candles in the foreground. The scene appears in sweet, spiritual, religious greens, gold, white, and blue hues. This beautiful holy image measures 5 1/2 inches tall and 3 7/8 inches wide. TWO BELLS TREE ORNAMENT CLOSEUP. This magical, Wayang-kulit style TWO CHRISTMAS BELLS ornament represents the finest handcrafted artisanry from the legendary, tropical island of Bali. Bali is famous for breath-taking landscapes, volcanoes, emerald rice terraces, colorful flowers, and world-renowned white sand beaches. Bali is also admired for its art: the Balinese are gifted in painting, stone-carving, wood carving and sculpture, gamelan music, and dance: three million productive peasants by day, brilliant artists by night. The lush island of Bali is a great verdant stage for continuous religious ceremonies and sacred puppet theatre performances. These rare, brand new Christmas ornaments reflect Bali's famous, ancient shadow puppet play theatre (wayang, meaning puppet, kulit meaning skin) . The wayang kulit is one of the great, ancient, story-telling traditions of the Balinese and Javanese: performances use over sixty different puppet characters carved out of flat pieces of buffalo hide manipulated behind a screen by an experienced dalang (puppet master). Each hanging, Christmas tree ornament is individually handmade in a home village workshop by a local craftsman from traditionally processed leather. The TWO FESTIVE HOLIDAY CHRISTMAS BELLS for sale here is individually hand created, hand cut, hand painted, and hand-finished. Each DETAILED piece is double--sided, making it particularly beautiful, usable, and valuable: the design is very closely identical on both sides. The unique ornaments have been commissioned, designed to order, and adapted to Western Christmas themes, concepts, and motifs with stunning, art gallery-quality results. The HOLIDAY CHRISTMAS BELLS ORNAMENT appears in HOLIDAY GREEN, RED, BLUE, AND GOLD hues. This beautiful CHRISTMAS TWO-BELLS ORNAMENT measures 3 3/8 inches tall and 3 1/2 inches wide. This style of Christmas ornament is a brand new product in America and is only available exclusively from Paradise Products International, LLC. TWO BELLS TREE ORNAMENT. DIMENSIONS: 3 3/8 INCHES TALL, 3 1/2 INCHES WIDE. Large quantities for Christmas are available and can be ordered in advance and upon request. A WHOLESALE OR RETAIL QUANTITY OF 100 PIECES IS AVAILABLE RIGHT NOW. he HOLIDAY CHRISTMAS BELLS ORNAMENT appears in BRIGHT, BRILLIANT, HOLIDAY GREEN, RED, BLUE, AND GOLD hues. This beautiful CHRISTMAS TWO-BELLS ORNAMENT measures 3 3/8 inches tall and 3 1/2 inches wide. The TWO FESTIVE HOLIDAY CHRISTMAS BELLS for sale here is individually hand created, hand cut, hand painted, and hand-finished. Each DETAILED piece is double--sided, making it particularly beautiful, usable, and valuable: the design is very closely identical on both sides. The unique ornaments have been commissioned, designed to order, and adapted to Western Christmas themes, concepts, and motifs with stunning, art gallery-quality results. This magical, Wayang-kulit style TWO CHRISTMAS BELLS ornament represents the finest handcrafted artisanry from the legendary, tropical island of Bali. WAYANG KULIT-STYLE CHRISTMAS BELL ORNAMENT. Each hanging, Christmas tree ornament is individually handmade in a home village workshop by a local craftsman from traditionally processed leather. The TWO FESTIVE HOLIDAY CHRISTMAS BELLS for sale here is individually hand created, hand cut, hand painted, and hand-finished. Each DETAILED piece is double--sided, making it particularly beautiful, usable, and valuable: the design is very closely identical on both sides. The unique ornaments have been commissioned, designed to order, and adapted to Western Christmas themes, concepts, and motifs with stunning, art gallery-quality results. The HOLIDAY CHRISTMAS BELLS ORNAMENT appears in HOLIDAY GREEN, RED, BLUE, AND GOLD hues. This beautiful CHRISTMAS TWO-BELLS ORNAMENT measures 3 3/8 inches tall and 3 1/2 inches wide. Each hanging, Christmas tree ornament is individually handmade in a home village workshop by a local craftsman from traditionally processed leather. The LAVISHLY DECORATED AND ORNAMENTED CHRISTMAS TREE for sale here is individually hand created, hand cut, hand painted, and hand-finished. Each detailed piece is double--sided, making it particularly beautiful, usable, and valuable: the design is very closely identical on both sides. Sure to be a cherished family heirloom, the unique ornaments have been commissioned, designed to order, and adapted to Western Christmas themes, concepts, and motifs with stunning, art gallery-quality results. This TRADITIONAL, DECORATED CHRISTMAS TREE HAS PURPLE, RED, YELLOW, AND BLUE HANGING BALLS AND LIGHTS, SCARLET RED RIBBONS WOUND AROUND THE TREE, RED AND WHITE CANDY CANES, AND A YELLOW STAR ON THE TOP. THE TREE appears in BRIGHT EMERALD, HOLIDAY GREEN WITH RED, BLUE, YELLOW, AND PURPLE ORNAMENTAL COLORS. This beautiful UNIQUE CHRISTMAS TREE measures a generous 5 1/4 inches tall and 3 1/2 inches wide. DECORATED CHRISTMAS TREE, HANGING ORNAMENTS. DIMENSIONS: 5 1/4 INCHES HIGH, 3 1/2 INCHES WIDE. WAYANG KULIT-STYLE CHRISTMAS ORNAMENT--THE PERFECT TREE FOR YOUR TREE! DECORATED CHRISTMAS TREE, HANGING ORNAMENTS. HIGHLY DETAILED CANDY CANES AND BALLS CLOSEUP. A WHOLESALE OR RETAIL QUANTITY OF 100 PIECES IS AVAILABLE RIGHT NOW. THIS TRADITIONAL, DECORATED CHRISTMAS TREE HAS PURPLE, RED, YELLOW, AND BLUE HANGING BALLS AND LIGHTS, SCARLET RED RIBBONS WOUND AROUND THE TREE, RED AND WHITE CANDY CANES, AND A YELLOW STAR ON THE TOP. THE TREE appears in BRIGHT EMERALD, HOLIDAY GREEN WITH RED, BLUE, YELLOW, AND PURPLE ORNAMENTAL COLORS. THIS BEAUTIFUL, UNIQUE CHRISTMAS TREE measures a generous 5 1/4 inches tall and 3 1/2 inches wide. Each hanging, Christmas tree ornament is individually handmade in a home village workshop by a local craftsman from traditionally processed leather. The LAVISHLY DECORATED AND ORNAMENTED CHRISTMAS TREE for sale here is individually hand created, hand cut, hand painted, and hand-finished. Each detailed piece is double--sided, making it particularly beautiful, usable, and valuable: the design is very closely identical on both sides. COLORFULLY DECORATED, BRIGHT GREEN CHRISTMAS TREE! This magical, ornate, Wayang-kulit style DECORATED CHRISTMAS TREE ornament represents the finest handcrafted artisanry from the legendary, tropical island of Bali. Each hanging, Christmas tree ornament is individually handmade in a home village workshop by a local craftsman from traditionally processed leather. The LAVISHLY DECORATED AND ORNAMENTED CHRISTMAS TREE for sale here is individually hand created, hand cut, hand painted, and hand-finished. Each detailed piece is double--sided, making it particularly beautiful, usable, and valuable: the design is very closely identical on both sides. Sure to be a cherished family heirloom, the unique ornaments have been commissioned, designed to order, and adapted to Western Christmas themes, concepts, and motifs with stunning, art gallery-quality results. DECORATED CHRISTMAS TREE, HANGING ORNAMENTS, CLOSEUP. THIS TRADITIONAL, DECORATED CHRISTMAS TREE HAS PURPLE, RED, YELLOW, AND BLUE HANGING BALLS AND LIGHTS, SCARLET RED RIBBONS WOUND AROUND THE TREE, RED AND WHITE CANDY CANES, AND A YELLOW STAR ON THE TOP. This beautiful UNIQUE CHRISTMAS TREE measures a generous 5 1/4 inches tall and 3 1/2 inches wide. This style of Christmas ornament is a brand new product in America and is only available exclusively from Paradise Products International, LLC. THE TREE APPEARS IN BRIGHT EMERALD, HOLIDAY GREEN WITH RED, BLUE, YELLOW, AND PURPLE ORNAMENTAL COLORS. DECORATED CHRISTMAS TREE, BALI WAYANG-KULIT STYLE. THIS TRADITIONAL, DECORATED CHRISTMAS TREE HAS PURPLE, RED, YELLOW, AND BLUE HANGING BALLS AND LIGHTS, SCARLET RED RIBBONS WOUND AROUND THE TREE, RED AND WHITE CANDY CANES, AND A YELLOW STAR ON THE TOP. THE TREE appears in BRIGHT EMERALD, HOLIDAY GREEN WITH RED, BLUE, YELLOW, AND PURPLE ORNAMENTAL COLORS. This beautiful UNIQUE CHRISTMAS TREE measures a generous 5 1/4 inches tall and 3 1/2 inches wide. ANGEL KNEELING. FACE AND WINGS CLOSEUP. INDIVIDUALLY HANDMADE FROM TRADITIONALLY PROCESSED LEATHER--CUT, PAINTED, AND DESIGNED TO ORDER. ANGEL KNEELING. LOWER BODY—BOTTOM OF FIGURE CLOSEUP. The kneeling angel with wings appears in sweet, spiritual, religious yellow, green, gold, and red hues. This beautiful holy angel measures 3 7/8 inches tall and 2 1/8 inches wide. The kneeling angel with wings appears in sweet, spiritual, religious yellow, green, gold, and red hues. This beautiful holy angel measures 3 7/8 inches tall and 2 1/8 inches wide. Each hanging, Christmas tree ornament is individually handmade in a home village workshop by a local craftsman from traditionally processed leather. The angel for sale here is individually hand created, hand cut, hand painted, and hand-finished. Each piece is double--sided, making it particularly beautiful, usable, and valuable: the design is very closely identical on both sides. The unique ornaments have been commissioned, designed to order, and adapted to Western Christmas themes, concepts, and motifs with stunning, art gallery-quality results. The kneeling angel with wings appears in sweet, spiritual, religious yellow, green, gold, and red hues. This beautiful holy angel measures 3 7/8 inches tall and 2 1/8 inches wide. This style of Christmas ornament is a brand new product in America and is only available exclusively from Paradise Products International, LLC. This magical, Wayang-kulit style Christmas angel ornament represents the finest handcrafted artisanry from the legendary, tropical island of Bali. Bali is famous for breath-taking landscapes, volcanoes, emerald rice terraces, colorful flowers, and world-renowned white sand beaches. Bali is also admired for its art: the Balinese are gifted in painting, stone-carving, wood carving and sculpture, gamelan music, and dance: three million productive peasants by day, brilliant artists by night. The lush island of Bali is a great verdant stage for continuous religious ceremonies and sacred puppet theatre performances. These rare, brand new Christmas ornaments reflect Bali's famous, ancient shadow puppet play theatre (wayang, meaning puppet, kulit meaning skin) . The wayang kulit is one of the great, ancient, story-telling traditions of the Balinese and Javanese: performances use over sixty different puppet characters carved out of flat pieces of buffalo hide manupulated behind a screen by an experienced dalang (puppet master). THE SNOWFLAKE-STARS ARE AVAILABLE IN A CHOICE OF FIVE HOLIDAY COLORS: BRILLIANT BLUE, SCARLET RED, SACRAMENTAL YELLOW, HEARTWARMING AUTUMN ORANGE-GOLD, AND RICH GOLD-SILVER. AN ENTIRE CHRISTMAS TREE CAN BE DECORATED IN A MATCHING, SNOWFLAKE-STAR THEME USING A VARIETY OF COLORS TO PROVIDE LIGHT AND LOVE ON CHRISTMAS DAY. THIS BEAUTIFUL, UNIQUE SNOWFLAKE-STAR MEASURES A GENEROUS 6 1/4 INCHES TALL AND 5 1/4 INCHES WIDE. EACH HANGING, SNOWFLAKE-STAR ORNAMENT IS INDIVIDUALLY HANDMADE IN A HOME VILLAGE WORKSHOP BY A LOCAL CRAFTSMAN FROM TRADITIONALLY PROCESSED LEATHER. THE LAVISHLY DECORATED AND HAND-PAINTED SNOWFLAKE-STARS FOR SALE HERE ARE INDIVIDUALLY HAND CREATED, HAND CUT, HAND PAINTED, AND HAND-FINISHED. EACH DETAILED PIECE IS DOUBLE--SIDED, MAKING IT PARTICULARLY BEAUTIFUL, USABLE, AND VALUABLE: THE DESIGN IS VERY CLOSELY IDENTICAL ON BOTH SIDES. SURE TO BE A CHERISHED FAMILY HEIRLOOM, THE UNIQUE ORNAMENTS HAVE BEEN COMMISSIONED, DESIGNED TO ORDER, AND ADAPTED TO WESTERN CHRISTMAS THEMES, CONCEPTS, AND MOTIFS WITH STUNNING, ART GALLERY-QUALITY RESULTS. COLORFULLY DESIGNED AND BRILLIANTLY HAND PAINTED SNOWFLAKE-STARS! THIS MAGICAL, ORNATE, WAYANG-KULIT STYLE SNOWFLAKE-STAR (VERY VERSATILE, AS IT CAN SERVE AS A BEAUTIFUL, DELICATE, WINTER SNOWFLAKE OR A STAR) REPRESENTS THE FINEST HANDCRAFTED ARTISANRY FROM THE LEGENDARY, TROPICAL ISLAND OF BALI. COLORFULLY DESIGNED AND BRILLIANTLY HAND PAINTED SNOWFLAKE-STAR! THIS MAGICAL, ORNATE, WAYANG-KULIT STYLE SNOWFLAKE-STAR (VERY VERSATILE, AS IT CAN SERVE AS A BEAUTIFUL, DELICATE, WINTER SNOWFLAKE OR A STAR) REPRESENTS THE FINEST HANDCRAFTED ARTISANRY FROM THE LEGENDARY, TROPICAL ISLAND OF BALI. BALI IS FAMOUS FOR BREATH-TAKING LANDSCAPES, VOLCANOES, EMERALD RICE TERRACES, COLORFUL FLOWERS, AND WORLD-RENOWNED WHITE SAND BEACHES. BALI IS ALSO ADMIRED FOR ITS ART: THE BALINESE ARE GIFTED IN PAINTING, STONE-CARVING, WOOD CARVING AND SCULPTURE, GAMELAN MUSIC, AND DANCE: THREE MILLION PRODUCTIVE PEASANTS BY DAY, BRILLIANT ARTISTS BY NIGHT. THE LUSH ISLAND OF BALI IS A GREAT VERDANT STAGE FOR CONTINUOUS RELIGIOUS CEREMONIES AND SACRED PUPPET THEATRE PERFORMANCES. THESE RARE, BRAND NEW CHRISTMAS ORNAMENTS REFLECT BALI'S FAMOUS, ANCIENT SHADOW PUPPET PLAY THEATRE (WAYANG, MEANING PUPPET, KULIT MEANING SKIN). THE WAYANG KULIT IS ONE OF THE GREAT, ANCIENT, STORY-TELLING TRADITIONS OF THE BALINESE AND JAVANESE: PERFORMANCES USE OVER SIXTY DIFFERENT PUPPET CHARACTERS CARVED OUT OF FLAT PIECES OF BUFFALO HIDE MANIPULATED BEHIND A SCREEN BY AN EXPERIENCED DALANG (PUPPET MASTER). SNOWFLAKES FALLING FROM HEAVEN ON CHRISTMAS DAY--A SNOWY, WHITE CHRISTMAS REFLECTED IN CAPTIVATING WINTER COLORS. THE SNOWFLAKE-STARS ARE AVAILABLE IN A CHOICE OF FIVE HOLIDAY COLORS: BRILLIANT BLUE, SCARLET RED, SACRAMENTAL YELLOW, HEARTWARMING AUTUMN ORANGE-GOLD, AND RICH GOLD-SILVER. SNOWFLAKE STARS TO CAPTIVATE THE HEART: THE SNOWFLAKE-STARS ARE AVAILABLE IN A CHOICE OF FIVE HOLIDAY COLORS: BRILLIANT BLUE, SCARLET RED, SACRAMENTAL YELLOW, HEARTWARMING AUTUMN ORANGE-GOLD, AND RICH GOLD-SILVER. SHINING SNOWFLAKE-STARS IN BRILLIANT, DRESSED-UP, FAMILY-FRIENDLY HOLIDAY COLORS. COLORFULLY DESIGNED AND BRILLIANTLY HAND PAINTED SNOWFLAKE-STAR! THIS MAGICAL, ORNATE, WAYANG-KULIT STYLE SNOWFLAKE-STAR IS VERY VERSATILE, AS IT CAN SERVE AS A BEAUTIFUL, DELICATE, WINTER SNOWFLAKE OR A SHINING STAR. LARGE QUANTITIES FOR CHRISTMAS ARE AVAILABLE AND CAN BE ORDERED IN ADVANCE AND UPON REQUEST. AS EACH ITEM IS INDIVIDUALLY HAND-PRODUCED, ORDERS FOR THE CHRISTMAS SEASON SHOULD BE PLACED AS SOON AS POSSIBLE. A WHOLESALE OR RETAIL QUANTITY OF 100 PIECES IS AVAILABLE RIGHT NOW. FIVE SNOWFLAK-STARS--THE FULL RANGE OF AVAILABLE COLORS. EACH BEAUTIFUL, UNIQUE SNOWFLAKE-STAR MEASURES A GENEROUS 6 1/4 INCHES TALL AND 5 1/4 INCHES WIDE. SNOWFLAKES FALLING FROM HEAVEN ON CHRISTMAS DAY--A SNOWY, WHITE CHRISTMAS REFLECTED IN CAPTIVATING WINTER COLORS. AN ENTIRE CHRISTMAS TREE CAN BE DECORATED IN A MATCHING, SNOWFLAKE-STAR THEME USING A VARIETY OF COLORS TO PROVIDE A FAIRYLAND EFFECT OF LIGHT AND LOVE ON CHRISTMAS DAY. THIS BEAUTIFUL, UNIQUE SNOWFLAKE-STAR MEASURES A GENEROUS 6 1/4 INCHES TALL AND 5 1/4 INCHES WIDE. A QUARTET OF BEAUTIFUL FAIRYTALE SNOWFLAKE-STARS FOR HANGING ON THE CHRISTMAS TREE. THIS MAGICAL SNOWFLAKE-STAR APPEARS IN BRIGHT, STRIKING HOLIDAY RED WITH SCALLOPED BORDER EDGES AND GOLD AND WHITE ORNAMENTAL ACCENTS. THE SNOWFLAKE-STAR IS AVAILABLE IN A CHOICE OF FIVE COLORS: BRILLIANT BLUE, RED, YELLOW, AUTUMN ORANGE-GOLD, AND GOLD-SILVER. SEASONAL AUTUMN ORANGE-GOLD COLORS. EACH DETAILED PIECE IS DOUBLE--SIDED, MAKING IT PARTICULARLY BEAUTIFUL, USABLE, AND VALUABLE: THE DESIGN IS VERY CLOSELY IDENTICAL ON BOTH SIDES. SURE TO BE A CHERISHED FAMILY HEIRLOOM, THE UNIQUE ORNAMENTS HAVE BEEN COMMISSIONED, DESIGNED TO ORDER, AND ADAPTED TO WESTERN CHRISTMAS THEMES, CONCEPTS, AND MOTIFS WITH STUNNING, ART GALLERY-QUALITY RESULTS. WARM AUTUMNAL ORANGE-GOLD COLORS. EACH HANGING, SNOWFLAKE-STAR ORNAMENT IS INDIVIDUALLY HANDMADE IN A HOME VILLAGE WORKSHOP BY A LOCAL CRAFTSMAN FROM TRADITIONALLY PROCESSED LEATHER. THE LAVISHLY DECORATED AND HAND-PAINTED SNOWFLAKE-STAR FOR SALE HERE IS INDIVIDUALLY HAND CREATED, HAND CUT, HAND PAINTED, AND HAND-FINISHED. AN ENTIRE CHRISTMAS TREE CAN BE DECORATED IN A WAYANG-KUILT-STYLE THEME WITH COLOR-COORDINATED SNOWFLAKE-STARS, DOUBLE-BELLS, CHRISTMAS CAROLLERS, ANGELS, NATIVITY SCENES, SANTAS WITH REINDEERS, SANTAS WITH SACKS OF PRESENTS, AND DECORATED ORNAMENTED TREES, AND TEDDY SANTA BEARS USING A VARIETY OF COLORS TO PROVIDE A FAIRYLAND OF LIGHT AND LOVE ON CHRISTMAS DAY. THIS BEAUTIFUL, UNIQUE SNOWFLAKE-STAR MEASURES A GENEROUS 6 1/4 INCHES TALL AND 5 1/4 INCHES WIDE. THIS STYLE OF CHRISTMAS ORNAMENT IS A BRAND NEW PRODUCT IN AMERICA AND IS ONLY AVAILABLE EXCLUSIVELY FROM PARADISE PRODUCTS INTERNATIONAL, LLC. GOLD AND SILVER COLOR SCHEME. THE SNOWFLAKE-STAR IS AVAILABLE IN A CHOICE OF FIVE COLORS: BRILLIANT BLUE, RED, YELLOW, AUTUMN ORANGE-GOLD, AND GOLD-SILVER (PICTURED HERE). THIS MAGICAL SNOWFLAKE-STAR APPEARS IN BRIGHT, STRIKING HOLIDAY RED WITH SCALLOPED BORDER EDGES AND GOLD AND WHITE ORNAMENTAL ACCENTS. THE SNOWFLAKE-STAR IS AVAILABLE IN A CHOICE OF FIVE COLORS: BRILLIANT BLUE, RED, YELLOW, AUTUMN ORANGE-GOLD, AND GOLD-SILVER. THE ENCHANTING SNOWFLAKE PICTURTED HERE IS IN AUTUMN ORANGE-GOLD. THIS MAGICAL SNOWFLAKE-STAR APPEARS IN BRIGHT, STRIKING HOLIDAY RED WITH SCALLOPED BORDER EDGES AND GOLD AND WHITE ORNAMENTAL ACCENTS. THE SNOWFLAKE-STAR IS AVAILABLE IN A CHOICE OF FIVE COLORS: BRILLIANT BLUE, RED, YELLOW, AUTUMN ORANGE-GOLD, AND GOLD-SILVER. THE PICTURED SNOWFLAKE IS IN ENCHANTING AUTUMN ORANGE-GOLD. COLORFULLY DESIGNED AND BRILLIANTLY HAND PAINTED SNOWFLAKE-STAR! THIS MAGICAL, ORNATE, WAYANG-KULIT STYLE SNOWFLAKE-STAR (VERY VERSATILE, AS IT CAN SERVE AS A BEAUTIFUL, DELICATE, WINTER SNOWFLAKE OR A STAR) REPRESENTS THE FINEST HANDCRAFTED ARTISANRY FROM THE LEGENDARY, TROPICAL ISLAND OF BALI. EACH HANGING, SNOWFLAKE-STAR ORNAMENT IS INDIVIDUALLY HANDMADE IN A HOME VILLAGE WORKSHOP BY A LOCAL CRAFTSMAN FROM TRADITIONALLY PROCESSED LEATHER. THE LAVISHLY DECORATED AND HAND-PAINTED SNOWFLAKE-STAR FOR SALE HERE IS INDIVIDUALLY HAND CREATED, HAND CUT, HAND PAINTED, AND HAND-FINISHED. EACH DETAILED PIECE IS DOUBLE--SIDED, MAKING IT PARTICULARLY BEAUTIFUL, USABLE, AND VALUABLE: THE DESIGN IS VERY CLOSELY IDENTICAL ON BOTH SIDES. THESE MAGICAL SNOWFLAKE-STARS ARE AVAILABLE IN A CHOICE OF FIVE BRIGHT, STRIKING, HOLIDAY SEASON COLORS: BRILLIANT BLUE, SCARLET RED WITH SCALLOPED BORDER EDGES AND GOLD AND WHITE ORNAMENTAL ACCENTS, SACRAMENTAL YELLOW, HEARTWARMING AUTUMN ORANGE-GOLD, AND RICH GOLD-SILVER. THIS MAGICAL SNOWFLAKE-STAR APPEARS IN BRIGHT, STRIKING HOLIDAY BLUE WITH SCALLOPED BORDER EDGES AND GOLD AND WHITE ORNAMENTAL ACCENTS. THE SNOWFLAKE-STAR IS AVAILABLE IN A CHOICE OF FIVE COLORS: BRILLIANT BLUE, RED, YELLOW, AUTUMN ORANGE-GOLD, AND GOLD-SILVER. AN ENTIRE CHRISTMAS TREE CAN BE DECORATED IN A MATCHING, SNOWFLAKE-STAR THEME USING A VARIETY OF COLORS TO PROVIDE LIGHT AND LOVE ON CHRISTMAS DAY. THIS BEAUTIFUL, UNIQUE SNOWFLAKE-STAR MEASURES A GENEROUS 6 1/4 INCHES TALL AND 5 1/4 INCHES WIDE. AN ENTIRE CHRISTMAS TREE CAN BE DECORATED IN A WAYANG-KUILT-STYLE THEME WITH MIX AND MATCH, COLOR-COORDINATED SNOWFLAKE-STARS, DOUBLE-BELLS, CHRISTMAS CAROLLERS, ANGELS, NATIVITY SCENES, SANTAS WITH REINDEERS, SANTAS WITH SACKS OF PRESENTS, DECORATED ORNAMENTED TREES, AND TEDDY SANTA BEARS USING A VARIETY OF COLORS TO PROVIDE A FAIRYLAND EFFECT OF LIGHT AND LOVE ON CHRISTMAS DAY. THIS BEAUTIFUL, UNIQUE SNOWFLAKE-STAR MEASURES A GENEROUS 6 1/4 INCHES TALL AND 5 1/4 INCHES WIDE. THIS STYLE OF CHRISTMAS ORNAMENT IS A BRAND NEW PRODUCT IN AMERICA AND IS ONLY AVAILABLE EXCLUSIVELY FROM PARADISE PRODUCTS INTERNATIONAL, LLC.